Mitsubishi i-Miev - coming sooner? It may look like a giant soya bean on wheels, but the upcoming Mitsubishi i-Miev is nonetheless a tasty prospect. Based on the awkwardly named “i” city car, the i-Miev dispenses with fossil-fuel dinosaur power in favour of lithium-ion high-tech motivation. It’s designed to deliver a range of 100 miles and a terminal velocity of 80mph, and if it falls short Mitsubishi will only have itself to blame. Or itself to half-blame. The batteries hail from Lithium Energy Japan, a joint venture between GS Yuasa and Mitsubishi . Why are we writing about it now, bearing in mind all this info has been floating about out there for ages? Well, it turns out there’s some wrangling going on between Mitsubishi Motors UK and the Japanese top brass as to when the electric bean-mobile ought to make its debut on European roads. 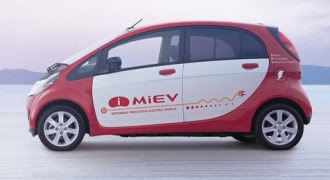 Japan gets the i-Miev next year and it’s not due to land in Europe until 2010. But the UK arm of the firm is twisting limbs back home to bring the car here earlier – for a London launch next year. Now that the London Congestion charge is back to square one, charging even the smallest petrol and diesel cars full whack for entry, the capital is once again proving a magnet for EV makers. We can’t wait.